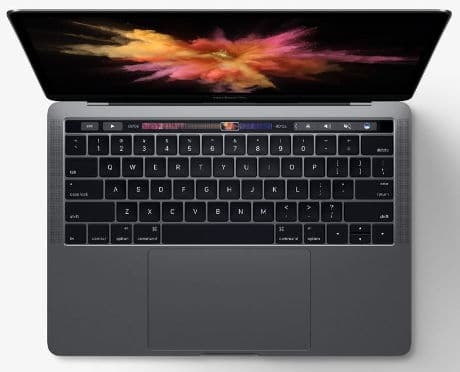 Apple has unveiled a new version of its MacBook Pro, including Touch ID to allow owners to make secure payments with Apple Pay from their laptop, as well as unlocking the machine and switching user accounts. Part of the Touch Bar feature, the Touch ID sensor matches the fingerprint reading with one stored in the secure element in the new Apple T1 chip. Leaked images of the OLED touch panel were available before the announcement in Cupertino, depicting an Apple Pay dialogue asking a customer to confirm a purchase with their fingerprint on the panel. The Touch Bar can also show tabs and favourites in the Safari browser, enable easy access to emoji in messages and provide a simple way to edit images. The macOS Sierra operating system includes Apple Pay and Siri integration. Earlier this week, CEO Tim Cook revealed Apple Pay transactions had risen nearly 500% year on year, with more purchases made in September 2016 than during the whole fiscal year in 2015. The mobile payments service launched in Japan this month, while Cook said it would be rolled out in Spain “in the next few months”. Laptops are playing catch-up to mobiles.